Hot damn, I love this tattoo. If you just came from the picture of the magnolias, you know I used to live in Savannah. This gal also lived in Savannah. Like ships in the night we bumped around the city for years narrowly avoiding a head on collision. 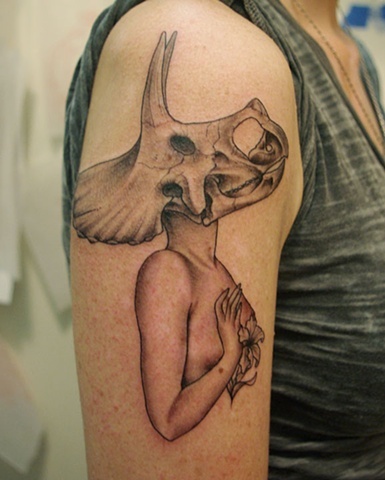 Eventually we both moved to Boston and just as prophesied in the Corinthians 7:29, I tattooed a naked lady with a dinosaur head on her. 'Tricititties' i like to call her. The tattoo, not the girl wearing it. That would be unprofessional.